If you love golf, teeing off on to the fairway is always a great adventure wherever you are! However, there are some spectacular golf courses out there that might make your round even more magical! Here at The Insurance Emporium, we love getting the most out of our passions. That’s why we’ve come up with a list of 7 top golfing destinations you just might want to add to your bucket list! If you’re in the mood for a golfing holiday with a real feel of adventure, you might want to consider South Africa! As well as being home to some of the world’s finest courses, the scenery is fantastic! The Leopard Creek Country Club could be a great choice for at least part of the trip. 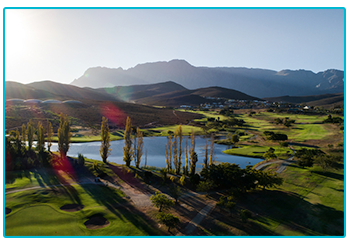 Designed by Gary Player, the course has put interesting golfing strategies first, as well as great views of course! Sitting on the edge of Kruger National Park, its water is also regularly home to crocodile, hippo and elephants! Perhaps not the obvious choice, but Iceland is certainly not holding back when it comes to golfing, with its glorious mountain and ocean views! One tenth of Iceland’s surface is covered by lava fields, which only adds to the dramatic feel! Akureyri Golf Club is the most northerly course in the world. Due to its location, it remains bright and sunny all night during the summer months! Wood you say no to a spot of midnight golfing? Hawaii, with its sun, sea and world class golf courses might just be your dream golfing location! The Plantation Golf Course on the island of Maui has been ranked number one in Hawaii. It also hosts the PGA tour’s Sentry Tournament of Champions every January. The course was designed to be in keeping with its amazing location on the mountain slopes. This means there are many dramatic changes in elevation — the huge slope on the 18th fairway might just help you hit the longest drive of your golfing adventures! Golf in Mexico has become more popular in recent years. With its sunshine, beaches and more than 200 courses, you might just be able to work out why! 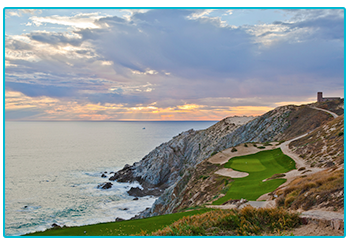 The Quivira Golf Club in Los Cabos is our pick for the most spectacular! Designed by Jack Nicklaus, the course takes players from the beach, through the desert and then up to more than 300 feet above the waves. With the 5th fairway being located on the edge of a sheer precipice, this isn’t one for the faint hearted! The picturesque Algarve has long been a favourite spot for golfers! Situated on the eastern side, looking out towards mountains and the ocean is another design from Jack Nicklaus; the Monte Rei resort. And it’s a real treat! With a challenging layout to get you thinking, water plays a part in a huge 11 of the 18 holes. The resort itself also offers fantastic service, with their Vistas restaurant even appearing in the Michelin Guide 2018! Well known for its fantastic courses, South Carolina could be a great location for your next adventure! Myrtle Beach might be the most common golfing area, but further south, The Ocean Course on Kiawah Island could be one of a kind! Otherwise known as “America’s toughest course”, ten of its holes are directly on the beach, amongst two miles of sand dunes. But the biggest bogey of them all here is the wind! Due to its exposed location, players can expect an eight club difference from round-to-round depending upon wind speed and direction! Although they’ve not always been the biggest fans of the game, golf in China has been moving fore-ward over recent years! 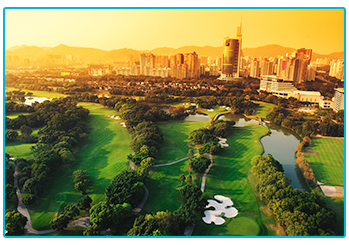 According to the Guinness World Records, Mission Hills resort in Shenzhen is the world’s largest golf facility! Set in 20 square kilometres and with twelve 18-hole courses, you might while away your entire adventure without leaving the resort! While you’re there, you can even have a go at a game of footgolf too — it happens to be the site of the China Footgolf Federation! Hopefully this list of exciting golfing destinations will help make your next holiday truly magical! If you’re planning on teeing off in far flung locations or just driving down to your local course, considering taking out golf insurance for your equipment could be a good idea. We can’t guarantee it’ll get you out of the bunker, but at The Insurance Emporium, you could get up to 30% off* Golf Insurance, with up to 90 days Worldwide Cover^. Head to The Insurance Emporium to find out more! * The 30% discount is available on lunar and calendar monthly policies and policies where the premium is paid annually. It is made up of 20% Introductory Discount plus 10% UK Golf Club Member Discount (if appropriate). The Introductory Discount is available for the first 12 premium payments on lunar and calendar monthly policies or one premium payment on annual policies. ^ Up to 90 days Worldwide Cover available on the Portrush level of cover. This blog is in no way sponsored, endorsed, administered by, or associated with The Leopard Creek Country Club, Akureyri Gold Club, The Plantation Golf Course, The Quivira Golf Club, Monte Rei, The Ocean Course or Mission Hills.